Jonathan Edwards is considered by many to be America’s greatest theologian. Many have lauded him as one of the great theologians in church history. 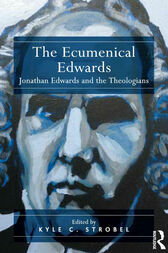 This book brings together major Catholic, Orthodox, and Protestant theologians to assess Edwards’s theological acumen. Each chapter places Edwards in conversation with a thinker or a tradition over a specific theological issue. Kyle C. Strobel, PhD, University of Aberdeen, is the Assistant Professor of Spiritual Theology at Talbot School of Theology, Biola University. He has written Jonathan Edwards’s Theology: A Reinterpretation (T&T Clark, 2013), Formed for the Glory of God: Learning from the Spiritual Practices of Jonathan Edwards (IVP, 2013), and Jonathan Edwards: An Introduction to His Thought with Oliver Crisp (Eerdmans, forthcoming). He has also edited Sanctified by Grace: A Theology of the Christian Life with Kent Eilers (T&T Clark, 2014) and Reading the Christian Spiritual Classics: A Guide for Evangelicals with Jamin Goggin (IVP Academic, 2013).